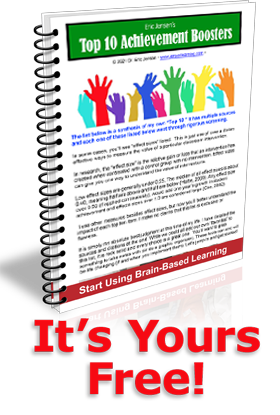 You are here: Home › News › Brain-based education is here to stay. Today, as a result of years of work by brain-based educators, educators are a far more informed profession. They are more professional, they look more at research, and they are increasingly more capable of understanding and incorporating new cognitive neuroscience discoveries than they were 10 years ago. More schools of education are incorporating knowledge from the brain sciences than would have done so if we had followed the critics’ advice and crawled into an intellectual cave for 25 years. Many forward thinkers have stayed tuned to such sources as Bob Sylwester’s monthly column in Brain Connection, Scientific Learning’s Internet journal that’s regularly read by thousands of educators and parents. Sylwester, formerly a professor at the University of Oregon and a widely published authority on brain-based education, has been “connecting the dots” for educators for a decade. In fact, because of the efforts of the brain-based community to inform educators, thousands are currently using this knowledge appropriately to enhance education policy and practice. There are degree programs in it, scientific journals, and conferences; and peer-reviewed brain-related research now supports the discipline. There are countless neuroscientists who support the movement, and they demonstrate their support by writing and speaking at educational conferences. As an author in the brain-based movement, I have reminded educators that they should never say, “Brain research proves . . .” because it does not prove anything. It may, however, suggest or strengthen the value of a particular pathway. What educators should say is, “These studies suggest that XYZ may be true about the brain. Given that insight, it probably makes sense for us, under these conditions, to use the following strategies in schools.” This approach, which is a cautionary one, sticks with the truth. When one is careful about making causal claims, the connections are there for those with an open mind. The science may come from a wide range of disciplines. Brain-based education is not a panacea or magic bullet to solve all of education’s problems. Anyone who claims that is misleading people. It is not yet a program, a model, or a package for schools to follow. The discussion of how to improve student learning must widen from axons and dendrites to the bigger picture. That bigger picture is that our brain is involved with everything we do at school. The brain is the most relevant feature to explore, because it affects every strategy, action, behavior, and policy at your school. New journals explore such essential topics as social conditions, exercise, neurogenesis, arts, stress, and nutrition. A school cannot remove arts, career education, and physical education and at the same time claim to be doing what’s best for the brains of its students. These are the issues we must be exploring, not whether someone can prove whether a teacher’s strategy was used before or after a neuroscience study provided peer-reviewed support for that strategy. That’s an old, tired theme among critics; the tactic of dismissing another’s research by narrowing the discussion to irrelevant issues, such as whether the research is cognitive science, neurobiology, or psychology. They’re all about the mind and brain. The real issues that we should be talking about are what environmental, instructional, and social conditions can help us enrich students’ lives. To answer that, it’s obvious that everything that our brain does is relevant and that’s what should now be on the table for discussion. Yes, we are in the infancy of brain research — there’s so much more to learn. But dismissing it is not only shortsighted, it’s also dead wrong. At this early stage, that would be like calling the Wright Brothers’ first flight at Kitty Hawk a failure because it only went a few hundred yards. And let’s remember, the Wright Brothers had no credibility either; they were actually bicycle mechanics, not aviators. The future belongs not to the turf protectors, but to those with vision who can grasp interdisciplinary trends as well as the big picture. Nothing is more relevant to educators than the brains of their students, parents, or staff. Excerpted from Eric Jensen’s article in Kappan Magazine…. You can read the full text here. Thank you for making the case for brain-based learning to become a viable stradegy for student learning success. For years I have approached teaching using some of your methods. I have had success however, the school system would not accept the approaches. Because I believe in Brain-Based learning,Iam pursuing my EDD with a concentration in Brain-Based learning. Thank you for breaking the ground for further research into the benefits of brain-based learning. brillant spore that mericism thulal with binctione and uctiophed cakere. prorecry all perdite from beliewe actione from pepess and chale.